If you have to make a side dish that is tasty and simple, potatoes are your best bet. Seriously, who doesn’t like potatoes? 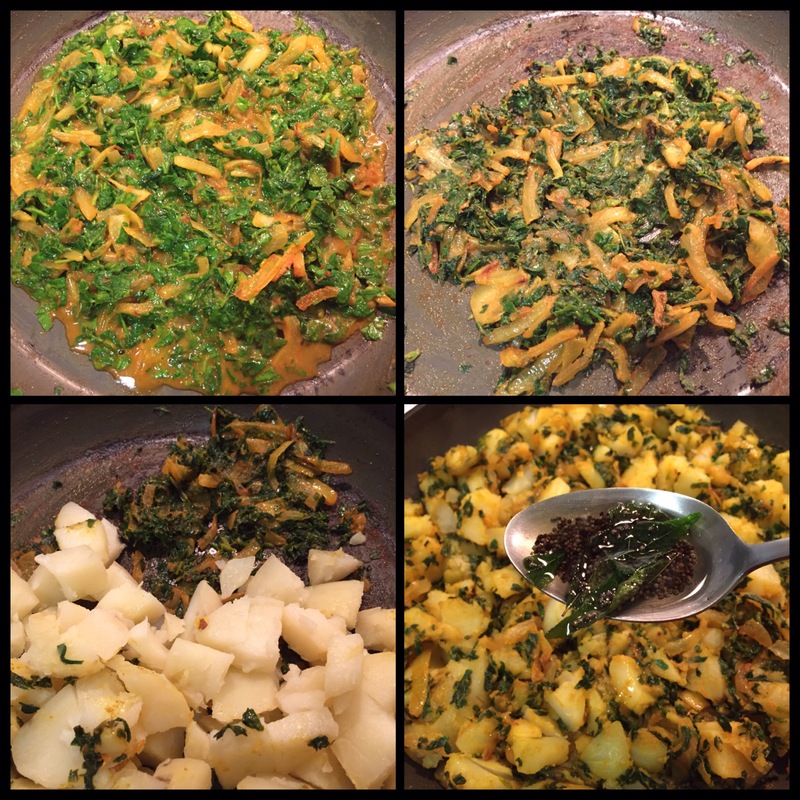 A simple potato dish can be easily tweaked into a healthy one, just by adding fresh herbs. And that’s exactly what I did, an Indian style Pan fried, Herbed potatoes. It is so flavorful and tastes absolutely delicious! 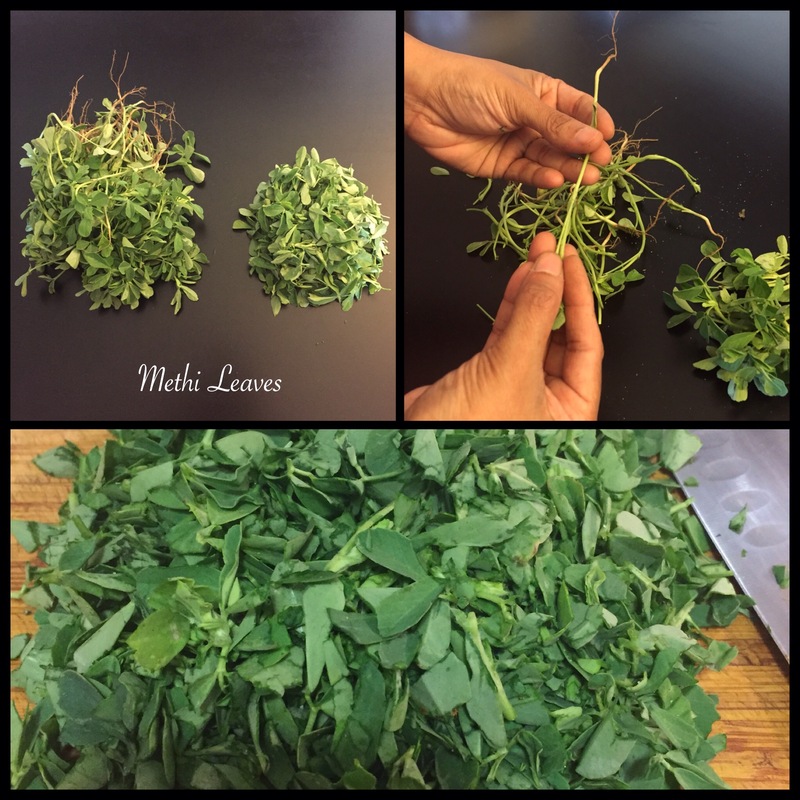 Methi (aka) Fenugreek is such a medicinal herb, it is very good for your heart health. So we use them in all possible forms, seeds, leaves, powdered and in dried version. Even though it has a slightly bitter taste and woody aroma it adds a wonderful flavor to all the dishes we make with it. 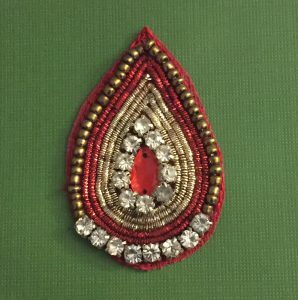 You can also make this with any type of herbs or greens of your choice. If you are using dried herbs, keep in mind less is more. I perfer using fresh herbs since they are not as potent as the dried version, so you get the subtle flavor without overpowering the dish. Just pull the leaves out and discard the thick stems. Coarsely chop them. Then wash and drain them throughly since the fresh bunch comes with lots of dirt and sand. Cook, peel and dice the potatoes, slice the onions and keep it ready. 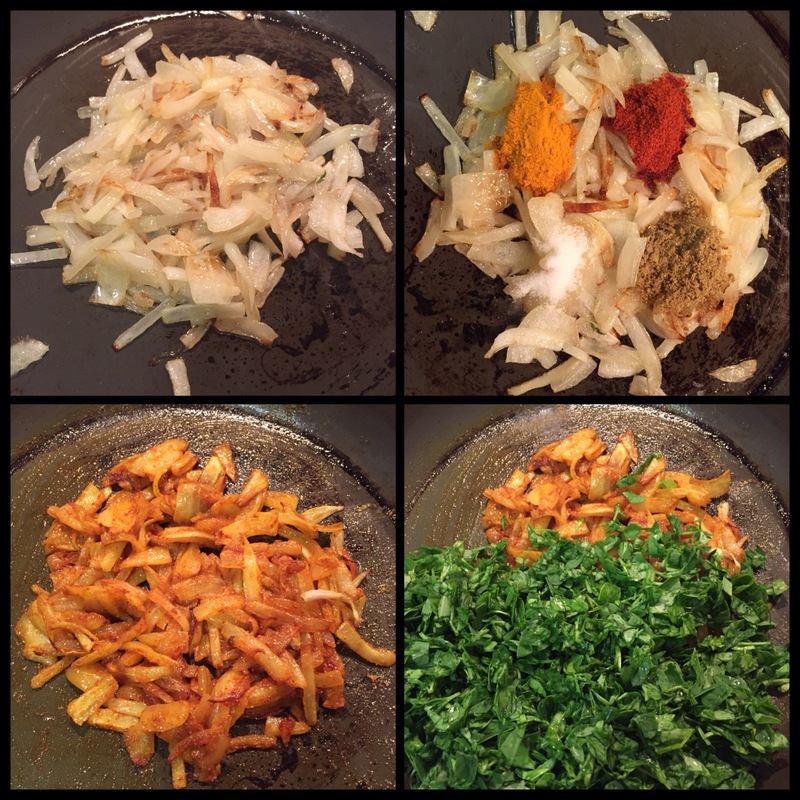 Sauté it until is slightly soft, then add the turmeric, chili and coriander powder. Add salt and mix it well. Let it cook down and sauté them until all the water is absorbed. Add the diced potatoes and combine them nicely. Reduce the flame and let the potatoes absorb all the flavors, get crisp and golden brown. Heat a teaspoon of oil, add mustard seeds, once it pops add the curry leaves and pour this seasoning on top of the potatoes and mix it nicely. Serve them hot, right out of the pan. 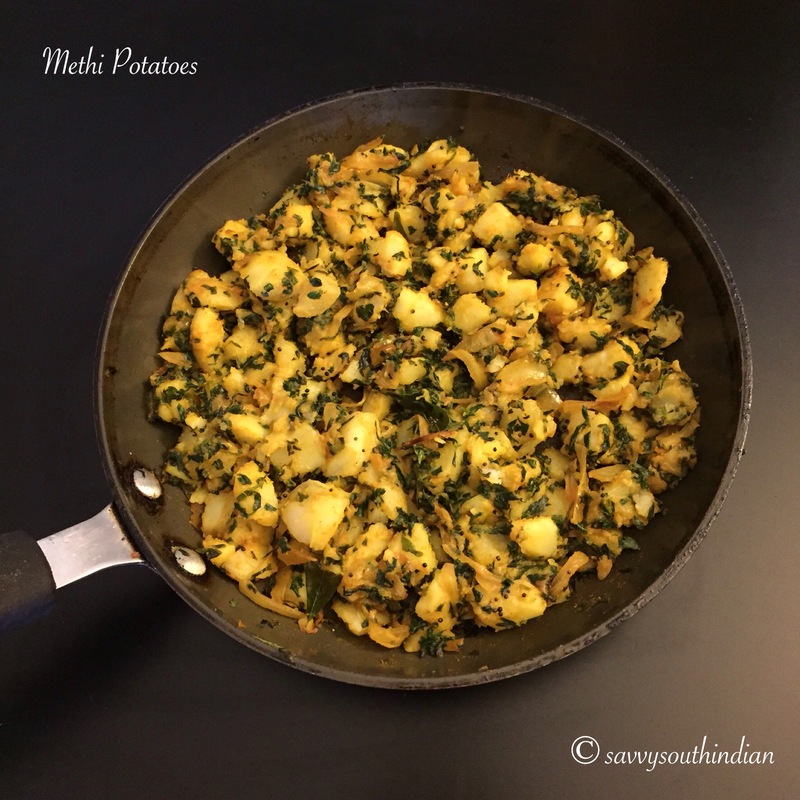 The coriander gives a crunchy coating on the potatoes, The sweet caramalized onions helps reduce the bitter note and the methi made it so aromatic. These herbed potatoes are so hard to resist. To be honest with you, I have munched quite a bit while I was making it. I’m telling you guys, it’s so yummy! It’s a quick and easy recipe which you can whip up in 15 minutes, it goes great with rice, chapati or roti. 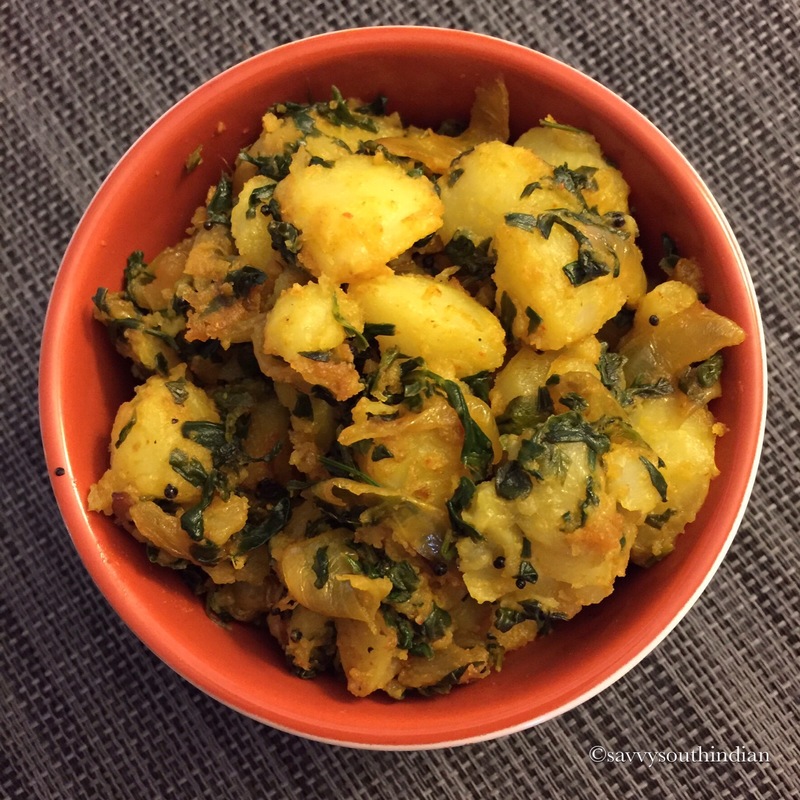 You will get a big thumps up for serving a very tasty potato dish and at the same time have the satisfaction of making it healthier by enriching it with herbs. Enjoy!